The Checkers sent Time Warner Cable Arena out in style with a 4-3 win thanks to late heroics by Brock McGinn. The IceHogs, who are currently locked in a tight division race, came out blazing with two strikes in the first eight minutes on goalie Rasmus Tirronen, who was making his first professional start. The Checkers refused to roll over, however, roaring back with two goals 93 seconds apart to knot things up heading into the second. The scoring evaporated in the middle frame, and the game proceeded to the third with the score even at two. The Checkers jumped back on top after Carolina first-round pick Haydn Fleury, also making his pro debut, sniped a wrist shot on the man advantage. The IceHogs hung in, however, again tying the game after taking advantage of a penalty shot awarded to Brandon Mashinter, who beat Tirronen five-hole with a shot that just trickled its way across the goal line, making the score 3-3 with just under six minutes to play. With the clock winding down, Brock McGinn emerged as the hero, collecting a rebound to the right of the goal and roofing it for the game winner. The victory closed the book on Time Warner Cable Arena, as the Checkers will begin playing at Bojangles’ Coliseum beginning next season. Tirronen was thrown into his first AHL action against a dynamic Rockford team that has a lot riding on this last stretch of the season. But despite the worthy opponent, the native of Finland buckled down and put his team in a position to win. The IceHogs tested Tirronen early, netting two goals before the midway point of the first period. While it would have been easy for the game to spiral out of control at that point, the young netminder was able to shake those off and improve as the game went on. Tirronen was quick to pass the credit of his first pro win onto his teammates in front of him. In front of Tirronen was a defensive corps just as inexperienced as he. Of the six defensemen in Charlotte’s lineup, five were rookies, while three of them were within the first five games of their pro careers. Thrown out there against a formidable Rockford team, the young group held their own. In his debut, Fleury had somewhat of a bumpy start, but his goal was a reminder of why he was the the Hurricanes’ top pick, seventh overall, in last year’s draft. Fleury was unfortunately forced to leave the game with an injury, needing assistance to the locker room and not returning. Zach Boychuk also left the game due to injury in the first and did not return. Daniels did not have any updates regarding their status after the game. With today being the last game that the team will play at Time Warner Cable Arena, Daniels acknowledged the five years of AHL history in the building, while keeping an eye toward a bright future at Bojangles’ Coliseum. 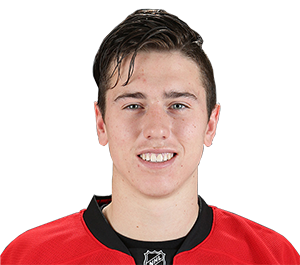 At 18 years and 277 days, Fleury became the youngest to ever play for the Checkers, breaking a record previously held by current Hurricane Elias Lindholm (18 years, 340 days) … The Checkers have been involved in a franchise-record eight penalty shot situations this season (four attempts for with one goal, four attempts against with two goals)… Defensemen Beau Schmitz and Josh Wesley and goaltenders Drew MacIntyre and Daniel Altshuller all sat as healthy extras … Forwards Greg Nemisz and Jared Staal missed the game due to injury.